Free? Paid? Ad-supported? Freemium? Dead? The creative destruction fueled by the Internet has led to a crisis in revenue models -- but it offers a radical new way to create a totally new pricing process that can change the game. Traditional business models are under increasingly severe pressure, especially for digital content, with its near-zero marginal cost, and the growing expectation of free content. Sellers cannot afford to provide good content and services free (or with just ads), but conventional pricing practices just don't work very well. This has disrupted music, TV/movies, news, and other content industries, and seriously threatens the continuing creation of high-quality content. One form of Internet-driven creative destruction is posited as inevitable in Chris Anderson’s influential book “Free: The Future of a Radical Price:” “eventually the force of economic gravity will win,” driving prices down to zero. Anderson gives an excellent overview of the current crisis in revenue models, and builds a richly developed case for the power of Free (especially in the hybrid form of freemium), but I suggest there is better answer to this crisis. What is needed in a revenue model for digital products, is not to choose the right price (free or not), but to create a dynamically adaptive pricing process. Selectively offer to let the buyer set any price he considers fair after the sale (Pay What You Want, post-sale ...or, more accurately, Pay What You Think Fair). Instead of a fixed price, this process generates a cooperative and adaptive cycle of offers and pricing actions, each based on feedback on how fairly the buyer sets his prices. Instead of static pay walls and freemium schemes, this process supports seamless and dynamic hybrid models. Those who pay fairly, rise above the pay wall -- those who do not, must face it. Pay What You Want (PWYW), in its basic form, is a very old pricing scheme, with obvious consumer appeal, but is hobbled by fundamental limitations -- getting people to pay fairly. In spite of these limitations, PWYW has gained attention as a way to monetize digital content that can be effective in some situations (as demonstrated by the rock band Radiohead in the example below). But we can make it much better. I suggest that the market can use the power of Internet scale monitoring and feedback to enable a new feedback process to solve the previously severe limitations of PWYW. Free also has obvious and severe limitations. We all know that free is rarely really free – there is no free lunch -- somebody pays – or you get what you pay for. Pay What You Want has the obvious advantage that it combines Pay with What You Want. Almost as nice as free for consumers, and something for sellers. The problem, of course, is the free-rider. Some pay a fair price, some pay very little, and some do not pay at all. It works to a degree, but not as well as most sellers need. But that is true only when buyers can free-ride without consequences -- now the Internet offers a new way to let sellers adaptively screen out free riders. Fair Pay What You Want (FPWYW), or FairPay for short (or, perhaps more clearly, Pay What You Think Fair), exploits the power of the Internet. FairPay, uses the Internet to monitor what buyers choose to pay, and to make that history available to the seller. It also uses the Internet to facilitate setting the price after the sale, and after initial verification of value. The seller considers the buyer’s history of fairness to decide whether to make future offers to that buyer to sell things on a FairPay basis -- or to fall back to conventional set pricing. FaiPay is a selective privilege. If the buyer is unfair in what he pays, that feedback will affect his FairPay reputation, limiting future opportunities to make purchases on a FairPay basis. The seller is always in control of whether to make new offers on a FairPay basis, under what circumstances. FairPay combines free, paid, and freemium, and makes it dynamically context sensitive. The buyer pays a fair price (which may include free when that is fair, such as for sampling, or when value is not received). 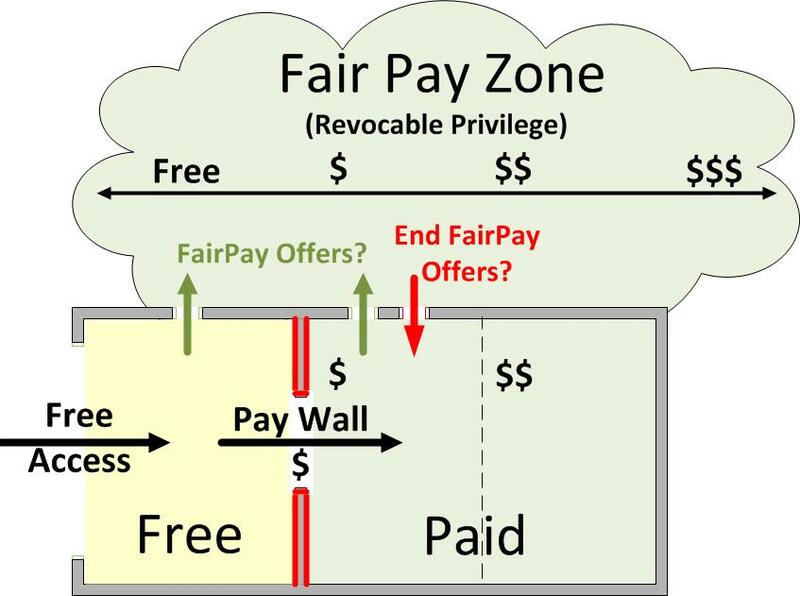 Because FairPay works as a self-limiting privilege, the buyer has a strong incentive to be fair and responsible about what he decides to pay. With its feedback-enforced fairness, FairPay drives a positive feedback cycle that can potentially create a whole new economic world order for major classes of products and services. FairPay does not just rely on innate buyer fairness, but looks over their shoulder and provides real consequences to help give that sense of fairness powerful weight. What goes around comes around. PWYW with teeth. FairPay processes and reputations might be managed internally to a specific merchant or publisher -- or applied more broadly, managed and shared among a network of merchants, much like a credit rating. The more widely it is used and shared, the more effective it will be. Before: The prominent rock band Radiohead offered their album “In Rainbows” in 2007 as a digital download, in one of the most noted Pay What You Want experiments ever. The average price was reported to be $2.26, but about 60% of downloader’s paid zero -- a very significant free-rider problem. Those who did pay, paid an average of $8.05 in the US and $4.64 elsewhere. A very mixed bag -- consistent with widespread evidence from behavioral economics that people generally have an inclination to fairness, but that relying on that alone is not likely to make for a good business. The problem is that this is a one shot deal, with only the vaguest hint of any consequences. FairPay: What if the same offer was made by iTunes or Amazon for five downloads – framed with the suggestion that if the FairPay price paid was satisfactory, the offer would be extended to five (or ten or twenty) more downloads? It seems safe to expect that, knowing their price would have consequences, free riding would drop dramatically. Those who might not have paid at all (in a Radiohead one-shot deal) would now be much more likely to pay something. Most of those who did pay something (with no strings at all) would now be much more likely to consider paying a bit more generously, knowing that they are being “watched” and hope to be rewarded with future FairPay offers. Before: WSJ.com has a substantial subscriber bases, at a very substantial price (about $100 per year) for a large-circulation digital product. But most Web users do not spring for any access at all – a loss to them and to the Journal. Before: Hulu, the studio-owned video portal, offers movies and TV on the Internet with an ad supported model, but finds it hard to get adequate revenue, and was reported to be considering paid subscriptions (and recently introduced them as its Hulu Plus service). YouTube has a very similar problem, and has been estimated to be losing nearly half a billion dollars a year (a figure Google said was too high and dropping, but by how much?). FairPay: What if these video services offered subscriptions on a FairPay basis? (Possibly with an ad-free benefit, or with the option of light ads versus heavier ads?) Instead of guessing what price the market would bear for a premium subscription ($9.95/month? ), Hulu could let the market tell them what it will pay. And for those who pay poorly (relative to their usage), Hulu could simply stop extending that FairPay offer, and simply require the set $9.95. To look a bit closer at how this might work, consider an Internet video service, call it HuTube. HuTube might currently offer free service, supported by advertising, and might have some premium services behind a pay wall, charging either by download/viewing, or by monthly subscription. Unlimited premium access is offered on a month-by-month basis upon subscription. The subscriptions might include options for access to premium content that might be behind a pay wall (such as recent theatrical movies and pay TV and network hit programs, etc.). It might also include ad-free, or reduced ad service. Depending on the FairPay price set by the user for the previous month(s), HuTube decides whether the FairPay subscription offer will or will not be extended for the next month. Price setting might gradually be reduced to a yearly cycle for established subscribers with good FairPay reputations. Usage reports would be provided to assist in the yearly pricing reviews, with details of usage by class of service (premium content, ad-free, etc.). Payments might be monthly (even if price setting is yearly). The options offered to any user on each renewal/pricing cycle would be adjusted based on their payment history (with consideration of any relevant circumstances known or reported). Thus those who pay fairly get increasing levels of trust and float above the pay wall, but those who do not get kicked back down into the pay wall. For the buyer, FairPay can have almost all of the appeal of Pay What You Want, and it adds a new dimension of fairness that makes it very beneficial to sellers as well. Because FairPay variations on PWYW set prices after the sale, the buyer can have the product "on approval," use it, and verify its value, with no risk. No fear of buyer remorse, no need to refrain trying something that might be of uncertain value. The buyer decides what to pay after seeing the value of the product or service. For the seller, FairPay feedback enables the seller to limit risk as well. The buyer develops a FairPay reputation, a known history of how well he pays for various kinds of products and services, under varying circumstances. That gives the seller the control needed to make FairPay offers only where his expected risk/reward profile is attractive, and to limit his value-at-risk. The free-riders are screened out, and relegated to the traditional world of set prices (at least to a greater extent than those who pay more fairly) . The net is that total revenue, and total profit, might be significantly higher than with a fixed price (at least for products with low marginal cost, as with digital media) -- and that total value created can be maximized. In its fundamental microeconomics, this is truly a radical pricing process. It enables more flexible revenue models with a new level of efficiency in pricing. FairPay prices serve as personalized metrics of the “utility” of a purchase to an individual buyer. They vary from buyer to buyer just as the value of a product varies from buyer to buyer. The FP price for an item sold is just what it is worth to that buyer at that time, to a good approximation. Revenue models become dynamic and "participative pricing" becomes a truly collaborative process. FairPay prices might not be ideal on a first cycle, but buyers and sellers will rapidly converge toward the ideal. Point number one of The Cluetrain Manifesto was that “markets are conversations” – FairPay makes pricing much more of a conversation, and an ongoing conversation, at that. Based on that conversation, the pay wall is automatically customized to each buyer, at each stage in the cycle. Sure, many FairPay users will pay less than they might have on a fixed price basis. But by how much? And how does that compare to the few that might pay more than regular price because they get high value? -- and, more importantly, to the very large number that might pay something, instead of paying zero (by not buying at all). An important by-product of FairPay is that it enables unprecedented richness in consumer-controlled sampling. At present, vendors give out free samples to attract new customers, a process that is very costly, blind, and wasteful. Samples often go to those who would already buy, or to those who would never buy, and miss many of those who might want a trial. Smart vendors can use FairPay to routinely offer reasonable levels of sampling at no charge, and such sampling can become conventional practice. In such cases, FairPay systems might enable consumers to sample without ever bothering to even set a price (automatically setting a default zero price after some pre-set time). So no pricing action is required at all, as long as the level of sampling is not excessive, after which a polite reminder could prompt users to pay, explain, or risk negative feedback and loss of the privilege of free sampling. That brings us back to freemium -- FairPay models can mimic many aspects of freemium, but FairPay sampling has significant advantages over freemium. Freemium models offer fixed boundaries of free access to some levels or types of access, with greater levels or types of access behind a rigid pay wall, requiring a set-price payment. Freemium models work by redistributing costs, so that paying customers subsidize free customers, but does so in ways that are rigid, granular and hard to tune. I think Chris Anderson might agree that there is another “long tail” in play here -- a long tail of pricing. Anderson’s long tail (in his previous book, “The Long Tail”) is a tail of items ranked by units sold. 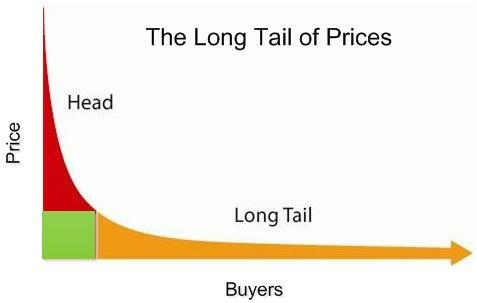 The long tail of pricing is a tail of buyers ordered by price paid. This long tail of buyers might turn out to contribute a very large portion of total revenue. Large numbers of buyers at low prices, who would not otherwise be buyers, can add up to a very large revenue figure. Sellers might find that revenue from their current market drops a bit, but the new revenue from their previously non-addressable market can become a very large number. An example of how FairPay pricing cuts through the artificial confines of conventional pricing is how it helps to finesse the classic dilemma of flat-rate versus usage-based pricing. Flat-rate or all-you-can-eat models are increasingly dominant for many kinds of services, especially in the digital world. Plans for long-distance phone service, Internet service, content, etc. have increasingly moved from pricing per unit of usage (minutes, bytes, articles, etc.) to plans that permit unlimited usage (per month). Even music shows some signs of moving from per song and per album "ownership" models to unlimited music per month models (as in Pandora and Rhapsody). Consumers seem to prefer flat-rate plans because there is no meter ticking to make them worry about paying for one more unit, or being surprised by a large bill. However sellers, and some users recognize there is an economic flaw, in that heavy users and light users both pay the same. This can be a severe problem for sellers (such as Internet providers who must bear the heavy uploads of users of peer-to-peer file-sharing services like Napster or BitTorrent, and AT&T's recent move away from unlimited mobile Internet service). It can also be a problem for light users, such as those who would like an occasional Wall Street Journal article, or occasional mobile Internet service. Whatever level the flat rate is set at, one size does a poor job of fitting all users. All-you-can-eat has consumer appeal, but often leads to flawed incentive structures that are costly and wasteful. FairPay avoids this dilemma by enabling prices to be based on perceived value. It lets users consider their usage level as one factor of many that contribute to value. They can factor in usage levels (and apply reasonable volume discounts), but need not be slave to that. Single ticks of the meter do not necessarily raise the price. One would expect many clicks to justify a higher price, but some clicks may be judged as more or less relevant than others. A user who glances at many articles for a short time might be justified in paying less than one who studies a few articles for a long time. The user's will know what they did, and usage reports can make that visible to both buyer and seller. Once again, rigid pricing rules give way to nuanced estimations of value. Proponents of new freemium models for newspapers (such as the New York Times or Journalism Online) speak of "dialing" different price settings to meet market needs by changing the number of free articles before requiring users to pay for an unlimited subscription access. I submit that it still a one-size-fits-all solution to a problem that needs more nuance. FairPay enables a far more nuanced way of "dialing" market behavior by giving users the pricing dial, but letting sellers control the renewal dial. Of course there will be many factors in play that determine whether buyers do, in aggregate, pay at a "fair" rate for any given seller and product. Why should buyers pay more than the absolute minimum they can? I suggest the answers will vary, but in general, behavior can be pushed to desirable levels by sellers that manage their customer relationship well. This gets to fundamental questions of how businesses relate to their customers, and whether they can change the "conversation" from a zero-sum game of which party can get the most from the other and give the least, to a win-win game, where both parties seek a mutually beneficial value exchange. Society seems to be broadly seeking a more win-win kind of market, and that is just what FairPay is all about. Related to the ideas in The Cluetrain Manifesto of markets as "conversations," Dan Pink's book "Drive" summarizes how there are different mind-sets to motivation, and current trends are pushing toward more win-win behaviors, building on on three elements: autonomy, mastery, and purpose. I suggest that FairPay helps change marketplace dialog to exploit exactly those elements, by giving buyers much more autonomy, opportunities to develop mastery, and ability to reflect their purpose into their pricing decisions. Sellers who position themselves as partners in value exchange, frame their FairPay offers thoughtfully, and work with their customers as partners seeking mutual benefit, will succeed in getting them to pay fairly. Those who do not may find it difficult. One aspect of this is how well the seller can position the price paid as being a well-deserved compensation for value creation, and necessary to ensure a continuing supply of value. This obviously factors into the modest success of musicians and game developers with conventional PWYW sales (why did so many pay more than one cent?). Such positioning is relatively easy for sellers who can claim that most of the price goes to compensation to artists, journalists, or other human contributors. It is also likely to benefit companies that, like Apple, are perceived as being focused on consumer value, or on other kinds of social benefit, such as green, charitable, etc. (The addition of charitable elements has been shown is some recent research on PWYW to very effective in discouraging free-riding.) Favorable positioning may be more of a challenge for companies that are perceived negatively, or simply as commodity suppliers, especially if not compensated by superior service or other positives. A further method for encouraging good payment levels would be for a seller to make it known that perks are offered to those who do pay well. This could be similar to the perks in frequent flyer programs that provide upgrades, visible recognition and status, and other special privileges. Such methods might even include making some aspects of good payment behavior visible as a status symbol (possibly only for those buyers who seek that kind of "conspicuous FairPayment"). Also, a good FairPay reputation might depend not only on how well you pay, but on how well you explain why you pay especially well or poorly in specific cases, thus giving the seller valuable feedback not just on pricing, but on the merits of their product. Buyers might be given visible recognition for such thoughtful feedback (such as badges) naming them as elite partners, a form of status reward (like top ranked reviewers on Amazon) that consumers might seek to earn and display with no fear of being seen as crass. Another factor that can strengthen the effectiveness of FairPay, as it develops, would be the emergence of shared FairPay infrastructures among multiple vendors that enable cross-vendor collection and sharing of reputation data. As discussed further below, this infrastructure might behave much like cross-vendor credit reporting and rating services. Just as with credit reports, consumers will be more inclined to behave well to avoid harming a FairPay pricing reputation that many vendors rely on. Radical change takes effort and education at many levels, and that will clearly be required to make FairPay pricing processes work. As just touched on, much of this relates to basic principles of customer relations. A first critical success factor is to educate buyers and sellers in how FairPay transactions can work and why they are desirable. FairPay turns many traditional ideas about pricing upside down, and shifts considerable responsibility to the buyer. Sellers will need to provide buyers with clear explanation of the basic process, and how and why their pricing should be fair. (See Sample FairPay Offer.) Sellers will need to carefully frame their specific FairPay offers to set expectations on value and responsibilities, to define relevant usage metrics, and to facilitate buyer pricing decisions. Rich data on how buyers use products and services, and analytic tools for understanding that usage will be important in buyer pricing, and in seller evaluation of that pricing. Implementing FairPay pricing processes within a business will change fundamental business processes. But if FairPay can make a material difference in business success, all of this is a hurdle that can be overcome. And some sellers are well positioned to do what it takes now. A second critical success factor is that a FairPay system must be very painless to use. Anderson speaks of a “penny gap:” the problem that thinking about paying even one cent creates a psychological barrier to a sale. As he explains, this is a key reason why micropayments have failed to be the salvation of digital business – they are just too much psychic friction. What this means for FairPay is that payment decisions for small purchases are most efficient when aggregated. FairPay will generally not work as well if buyers must think about pricing a single Web page or song or video clip. But it can work well for a subscription or other bulk purchase. This is how most people pay now for mobile phones and cable TV – not per item, but per month, for some large basket of items. As in our HuTube example, similar FairPay subscriptions could be paid monthly, and for consumers who have established good FairPay reputations, price setting might be done only annually. The better your FairPay reputation, the more freedom you will have to buy a large number of items on “approval”, and then review a usage “statement” and settle up infrequently, with relatively low burden (much like having a high credit limit and extended payment terms on a credit card). A third critical success factor to resolve is privacy concerns and information quality concerns. Obviously detailed data about what a person buys and what they choose to pay can be sensitive information. To the extent that uses of FairPay are applied within a given business, such as iTunes, Amazon, YouTube, etc., that is not much of a problem. Such sellers already have detailed sales histories that they take great care to keep confidential and adding FairPay price data to that adds little in the way of new concerns. FairPay could be important even if it were limited to use within trusted, self-contained sellers. But the economic potential is even greater if FairPay processes and reputations are applied across sellers, and to smaller sellers for whom a shared infrastructure would be most economical. FairPay information is not unlike credit report information which has similar privacy and data quality issues, and widely accepted methods for managing those issues (including for disputing/correcting erroneous reports). Similarly, purchase histories are known to credit card companies. Conventions can be developed as to who has access to what pools of data. For example, vendors like Amazon could provide Web services that support their affiliated merchants in making merchandising decisions without ever revealing the details of a buyer’s FairPay history or what specific products they bought. Other third-party FairPay merchant services (such as credit card companies, PayPal, Google Payments) could collect FairPay data and provide merchandising services to a network of merchants without disclosing the details. Such services might simply make a recommendation as to whether and how to make an offer, based on inputs from the seller, without disclosing any of the data used to do so, not even any reputation metric (other than the contextual recommendation to offer or not). In managing privacy, remember also that FairPay data collection is inherently opt-in – you can avoid any FairPay data collection about a product simply by avoiding a FairPay transaction. If you don’t want any given product and price tracked, just don’t buy that product on a FairPay basis. Use it only in situations where the benefits outweigh the concerns. In addition to the operational value and economy of scale of cross-vendor FairPay services, the power of the FairPay reputation feedback cycle will also be increased by cross-vendor sharing of reputation data. Smaller vendors will gain critical mass, larger vendors will have more complete data, and, as noted above, buyers will know that stiffing one vendor will affect their reputation, as seen by other vendors. As to how far through our economy this method can go, that remains to be seen. FairPay will generally not totally replace conventional pricing, but can grow into an increasingly important complement to conventional pricing methods. FairPay it is also applicable to physical products and services, as well, especially for those with low marginal cost (such as CDs/DVDs), or with low cost tie-ins (such as product service and support, and other product related services). This “modest proposal” for Fair Pay What You Want is obviously radical, and may at first seem naïve and impractical. But I suggest the impediments can be overcome, and the potential benefits to some businesses, and to society, can be huge. If you agree, I ask your support to help take the digital economy to a new level. If you disagree, I would be interested to understand exactly why. I invite feedback directly, and on my FairPay blog. Markets want to be smart and finely adapted to incentives. The Internet wants to be smart and adaptive. The Internet enables direct feedback that is immensely rich and timely. Direct feedback is the most powerful way to tune incentives. Free is inherently dumb, because it obscures market incentives. Set prices do not reflect value-as-realized (by individual buyers). Prices should correspond to value-as-realized. Buyers, not sellers perceive value-as-realized. Sellers should measure and manage buyer perception of value-as-realized. Maximize buyer perception of value-as-realized and a fair price will follow. A good pricing process is a conversation. The way to do pricing is to be a pricing process. Richard Reisman is president of Teleshuttle Corporation. He invites feedback on the FairPay concept, and seeks to work with strategic partners for the development of FairPay commerce. Reisman has been involved with digital media since its infancy, in a variety of technology and business roles, including as consultant, manager, entrepreneur, and inventor (with more than a dozen patents and a couple dozen more pending). Reisman can be reached at fairpay@teleshuttle.com. More on FairPay is http://teleshuttle.com/FairPay, and on his FairPay Zone blog at fairpayzone.com. Reader feedback on FairPay is important to developing this radical concept -- if you don't want to send an email, please fill out our anonymous FairPay concept survey at http://www.surveymonkey.com/s/J6KMP5Q. Copyright 2010, Teleshuttle Corp. All rights reserved.